Formsite software is a solution used to build online forms and surveys. Drag & drop tool is available to create your surveys with 100 customizable templates and 40 question types to create registrations, customer surveys, order forms, lead forms and more. The software integrates with Dropbox, Google Drive, Google Sheets, MailChimp, Microsoft OneDrive, Salesforce, Zapier, and more. How much does Formsite cost ? The pricing for Formsite starts at $19.95 per month. 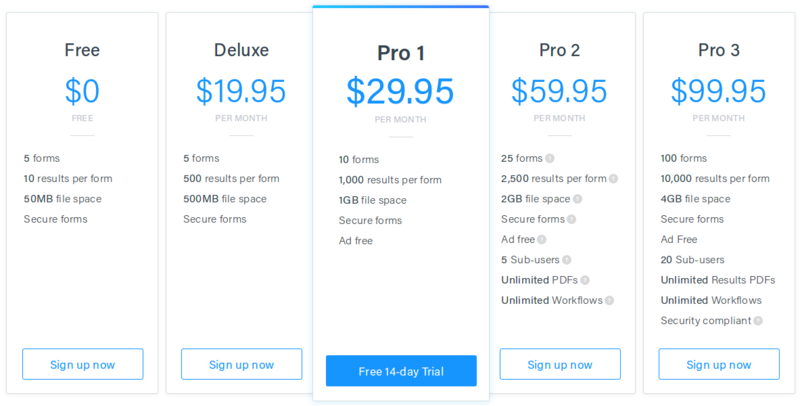 Formsite has 5 different plans such as - Deluxe at $19.95 per month, Pro 1 at $29.95 per month, Pro 2 at $59.95 per month, Pro 3 at $99.95 per month and Enterprise Services at $249.95 per month. Formsite also offers a Free Plan with limited features. Pros: It is so flexible and lets me customize the look and feel of my forms as well as create applications, surveys, etc. All the different options for drop-down, radio buttons, signature blocks, the ease of including photos and images are so great. I keep finding more ways to use it. Cons: tech support is not great, you can't call and talk to someone, which is really frustrating sometimes. Overall: I use it for so many things, and the continue to upgrade the features, which is nice. I really could not work without it now.